Yes folks that right. This Las Vegas Sign Company, Patrick’s Signs is truly your one stop shop, all in one neighborhood sign company, do it all Las Vegas sign guys, the good ole boys, and any other acronym you can come up with to describe the fastest growing sign company in Las Vegas. Specializing in pylon signs, monument signs, channel letters, lighting service, custom wraps, race team graphics, window graphics and so much more, why would you gamble on anyone else. Having been around since 1993 we know know what works and we truly are your most trusted versatile and trusted sign shop in town. With multiple install and graphics teams including but not limited to: sign install, vinyl install lighting service and custom designs, we are more than capable of catering to your every need. No job is too big, too small or out of reach for our customer service specialists teams. Check out one of our many projects completed this week. 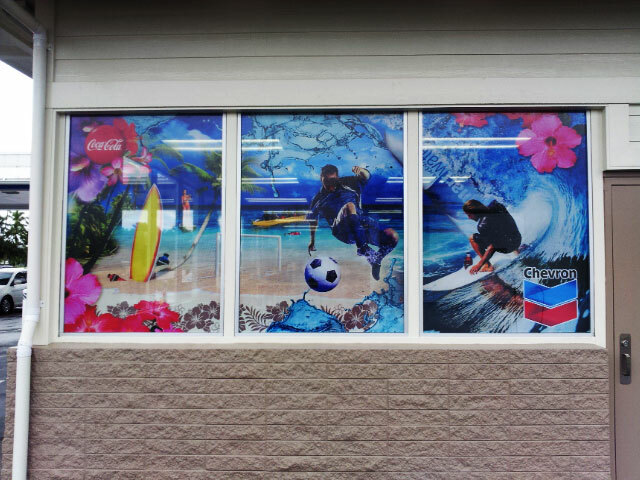 We worked directly with Coca Cola in Hawaii via email and phone conversations to successfully express their culture and love for their land in these custom window graphics designed and printed by Patrick’s Signs of Las Vegas. Check out the photos they sent us of the finished product! We love you guys!